Emily's square-pie spinoff Emmy Squared is headed to Williamsburg. CLINTON HILL — Clinton Hill pizzeria Emily is taking its square-pie spinoff to Williamsburg, according to reports. Owners Matt and Emily Hyland, along with chef Lou Tomczak, signed a lease in November for a space on the same block as their current restaurant, but after a legal battle with the building’s landlord, Emmy Squared will be opening up in Williamsburg this spring, Grubstreet reports. Matt Hyland told Grubstreet Emmy Squared will set up shop at 364 Grand St., which used to be Bill Baker’s Restaurant and Bar. 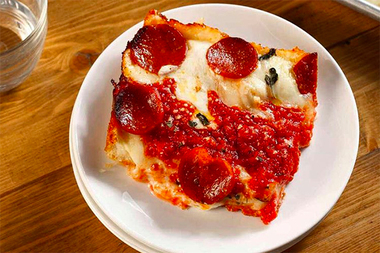 The new eatery will have at least 50 seats and a bar, and will serve Italian-American sandwiches and Detroit-influenced square pies, Grubstreet reports. The Hylands did not immediately respond to requests for comment. Emily, which has been at 919 Fulton St. since 2014, will remain at its Clinton Hill location where it serves both sweet and savory wood-fired pies, along with its popular Emmy Burger.